Three state-of-the-art, vintage-modeled EQ and compression plugins, bringing the big-budget sound of the world's most prestigious recording studios to your DAW. 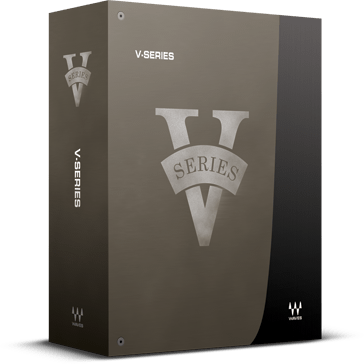 The legendary console sound, sought after by engineers and mixers around the world for over half a century, is now at your fingertips in the V-Series bundle. The original units are known for their unique, transformer-driven sound which, when pushed, imparts a rich and “big” analog vibe to recordings – a tone that shaped generations of popular music. The V-Series includes three plugins: two EQs and one compressor. The V-EQ3 is an accurate emulation of the 1066 and 1073 console EQs with Class A circuit designs, while the V-EQ4 is modeled after the 1081 model’s Class AB design. Both EQs provide distinctively rich tonal color to any music being run through them, even when using very slight EQ moves. The two models boast a unique ability to enhance the mid-range, add high-end sparkle, and give “body” to the source. The V-Comp is modeled after the discrete Class A circuit design of the classic 2254 console compressor. Using time constants and a fixed nominal output gain, the creamy tone of the unit is a known classic for gluing mixes together and providing a thick and “round” sound to recordings.